I am done with making this pp scrappy log cabin. Wonderering what you all think. I would do a thin blacke border and then do a wide piano key border. Or border with a turquoise color and black and white striped binding. I like it. I think your idea of piano keys is great. It's a beauty! So colorful... so neatly done. I think the turquoise and stripes would be great... but then the piano keys would be wonderful also. I'm such a big help! I love it! I would use a narrow black stop border first to separate the colorful center from any other border you might do. A piano key sounds good, or even a checkerboard or flying geese. My thoughts---- either nothing, just a solid color binding, or if a border, maybe a narrow black, then wider solid color. I think there's enough going on in the body of the quilt, don't want to distract, just confine and define. What Geri B said - there is so much going on in the body of the quilt - that any more would be confusing. It looks like a fun top - very very colorful - makes me think of a three ring circus - so much to see at one time. I like the black border and piano keys but then I am a scrapper!! Your quilt is beautiful! 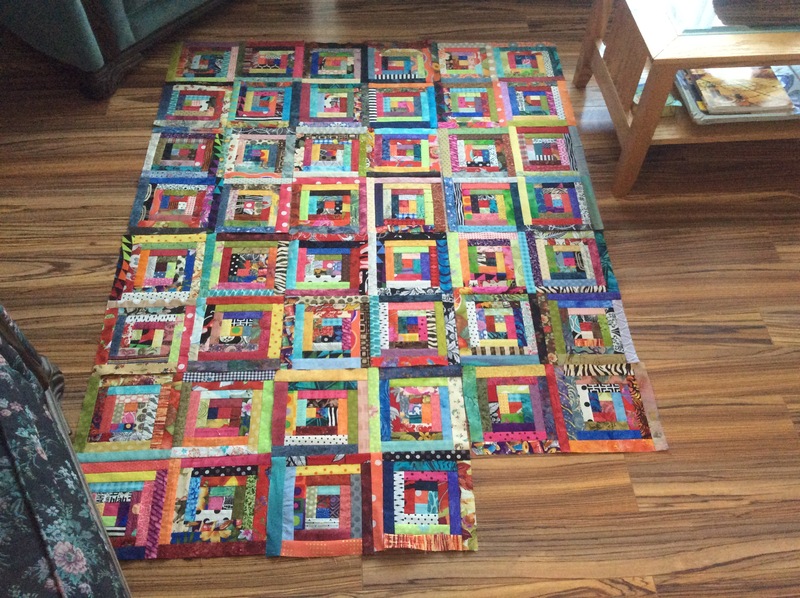 I am confused, but I haven't used narrow pieces of scraps, so why did you paper piece it? Is it because the scraps are narrow? Beautiful blocks and I think a turquoise narrow border would frame out your blocks and love the idea of a piano key border. I use piano key borders a lot and love the finishing look. Good luck on your finish and please share when you finish. I'd do the narrow black and then the turquoise with striped binding. The LC is linear enough. I wouldn't add more lines (piano keys). Count me as another for just a binding on it. A dark ... black or navy or dark green or ???? ... audition a few and sew what looks the best. Finished Binding Size? ... the same as the logs or twice the size. ...........keep making blocks, and skip the border options! JMHO: I would put a black border (fairly narrow), then do more log cabin blocks as the final border. Either the black/piano keys or the turquoise stripe will work. Depends on how much more work you want to do! I am a scrappy lover, too, and log cabin is my favorite block! My avatar photo is actually a brown and green log cabin with hand embroidered wildlife blocks. I also always paper piece my log cabins for accuracy. Love, love, love your quilt! Have you given any thought to how you will quilt it yet? Can't wait to see it finished. I agree - enough going on to merit a simple border. Love your log cabins! The colors are great. Your quilt is spectacular! If it were mine, I would add a solid black border the width of the logs, then finish with a turquoise border to bring out the various turquoise shades I see in almost every block -- contain it and frame it!! My favorite quilt pattern made scrappy, love it. The piano key border will use up more scraps but the other option sounds good also. Please share when done. I like your quilt a lot. I don't think I have ever seen a log cabin done scrappy before. I think the piano keys would be a distraction. I think I would use a black or navy border of 3 inches (give or take an half inch) and then bind it with sections of scraps. I would make the sections of miscellaneous lengths and join them on the bias. If you did this, you would need to be careful about the corners so you don't have seam joints at the corners.